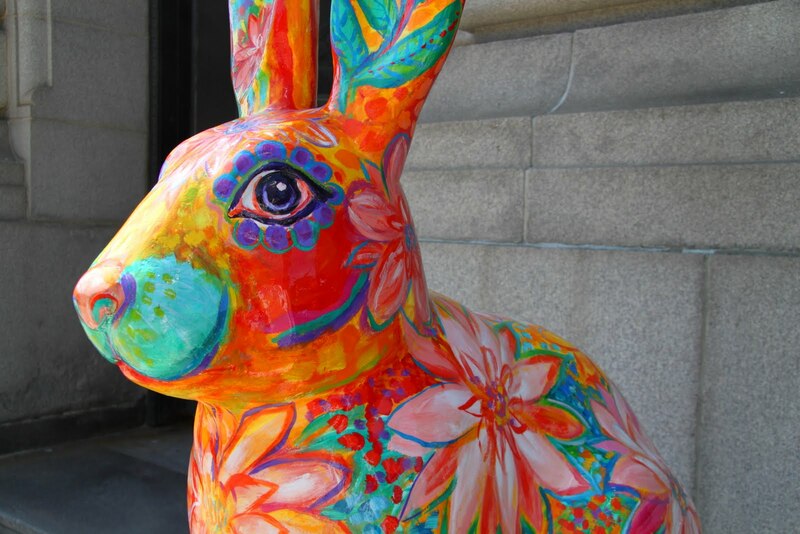 those would be the rabbits which are part of cleveland's st. clair superior development association's annual public art project celebrating the animals of the chinese zodiac. this weekend i went on my annual sculpture safari, hunting - with my camera, of course, the whimsical works created by local cleveland artists. in two days time i was able to capture all 24 rabbits - each day i went with friends and we made more friends along the way. pete seeger singing mister rabbit which is found on the album birds, beasts, bugs & fishes little & big: animal folk songs originally released in 1955. i've been playing this album of 28 animal folk songs since my em was a little girl. thanks to smithsonian folkways this classic album is still available! What amazing art Kimy! Thanks for showing it. Do you think tho, that the figures should be mice, not rabbits??? daisy am so happy to hear you enjoyed it. 2008 was the year of the rat (or mouse) and cleveland celebrated with some wonderful year of the rat pieces of public art....many of which i did show on the mouse - although i never made a flickr set of the rats - but i should! of course that would mean finding the photos! the year of the dog was 2006 - but that was before i started blogging and before i started trying to take pictures of all the statues. There were so many great rabbits I can't even choose my favorite tho I loved the first one that you featured....lotus blossom...also love the wonderful "coat" but they were all grand. I was born in the year of the tiger - how did I miss those pics? I do remember the ones of the rat tho. I think they are all awesome! And so is your photography! Those rabbit were great. Each one was so unique, I loved them and so glad you shared them!